Imagine going through a simple 4 step process that took less than 60 seconds and having your entire project structured, configured and setup for you. All you needed to do was add content. Using our FusionBox technology it is now possible to do exactly that. Simply choose from one of the templated business structures (which are all fully editable and customizable). This is the same technical setup that would have take a qualified programmer 2 or 3 weeks to do before. Now even a novice can manage it in less than a minute. Squeeze page, sales funnels, page layouts, drip feed membership sites, affiliate programs, mailing lists, autresponder sequences and hosting all taken care. There is even a template for GoToWebinar signup. Squeeze page, product, affiliate backend setup and configured, professional sales pages and autoresponder sequence all written and designed. All ready to go and start making money in just 60 seconds. All you need to do is choose which business (or businesses) you want to install. FusionHQ provides you with a simple to use, integrated and intutive interface for managing your online business. If you have ever tried doing business, or marketing online, you will know the typical challenges. The hours communicating with expensive staff, the constant integration issues between different scripts and services as well as the frustration of just wanting to be able to do things yourself (and now). Our customers have, from the very start, helped define its features and the very way in which it works. This means it is now packed with the features that are required to run a successful online business while remaining easy to use and simple to manage. We eat our own dog food. Not literally of course. "Eating your own dog food" is an expression used within Google. It basically means they use what they build. So, to what degree do we "eat our own dog food" at FusionHQ? FusionHQ uses its own mailers, own membership management system, templates and sales funnel builder to sell and manage itself. Yep, this page was built inside of FusionHQ. 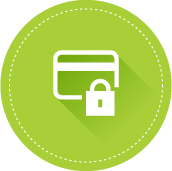 When you secure access the transaction will be managed by FusionHQ, and your membership will be handled by FusionHQ itself. No other competitor that we know of uses their own system to the same level we do (if at all). That means we have to be confident that things work, and you can be confident we will always be striving to stay the best. Try it out risk free and see for yourself. Not only is FusionHQ arguably the easiest marketing platform available, it is also one of the most comprehensive. It includes all of the usual features you would expect, plus many that are exclusive to FusionHQ. The list below is far from complete, but should give you a good idea of what you will get. Your entire technical setup taken care of in 60 seconds. 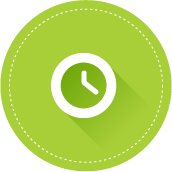 With FusionBox you can choose one of our premade business model structures and have your entire business setup, configured and ready to edit in under a minute. This can literally save weeks of work and hundreds or thousands of dollars. And this is no exageration. 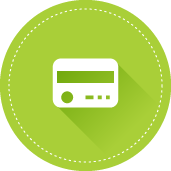 Part of FusionBox allows us to take the idea of ready to go businesses a step further. Not only is the business structure setup, but also products, sales letters and affiliate backend all designed and setup for you. Just choose your niche, install and promote your new site. Perfect for anyone starting out without a product or sales copy. The original and still the best. 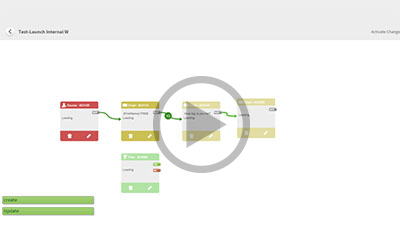 FusionHQ allows you to create true drag and drop sales flows. 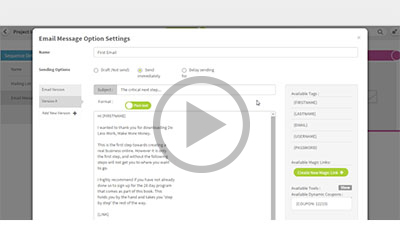 Build and manage squeeze pages, upsell and downsell sales pages and thank you pages all with point and click ease. 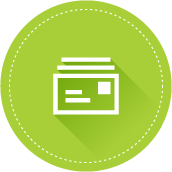 Choose from our templated processes, or create your own. Create one site or hundreds. Give access to only one, or to them all. The choice is yours. 1 Click to drip feed (time release) content and simple options to protect either whole pages or just certain sections of a page. IP security check ensures access only to those who buy. Simple intelligence. Using the drag and drop technology you can build entire sites. These can be content sites, mini sites, or affiliate review sites. No plugins needed to make it SEO friendly. (Why would you? Why not just design it to be SEO friendly from the start?) Simply add content and click upload. A massive time saver (and cost saver if you get others to do it for you). 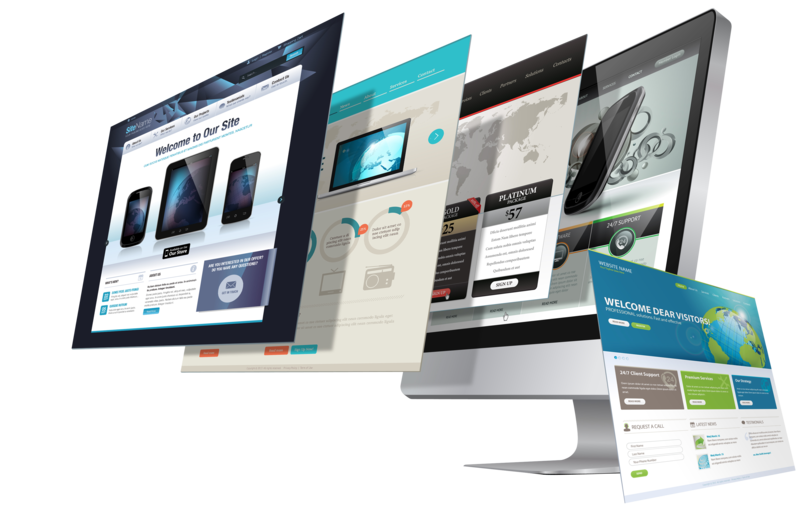 Replicate sites to create new one with similar design, orreplicate optin pages for different affiliates during a launch. 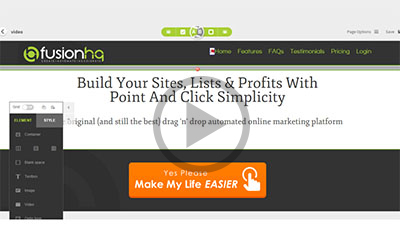 Replicate sales funnels, content sites or memberships sites in less than a second. 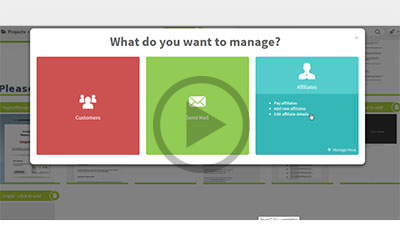 Integrated autoresponder and mailer allows you to build lists and follow up on leads. Use your own server to mail from, use a third party mailing service or use our inbuilt mail server and enjoy high deviverability rates - the choice is yours. You can set up optin forms to send data to Aweber, Get Response, iContact, Mail Chimp, InfusionSoft or 1 Shopping Cart,without the need for any code. Also includes a range of tested templates to get the look, and response, you want with a single click. 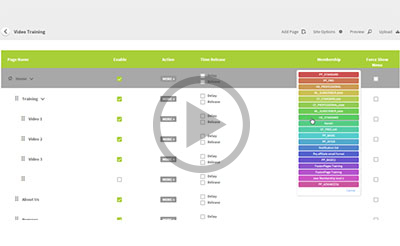 Create multiple membership levels tocontrol access to protected content. Make 1 access for multiple sites, or multiple accesses to 1 site. Easily manage members from the the FusionHQ dashboard. You can even auto remove a membership level should a customer upgrade. 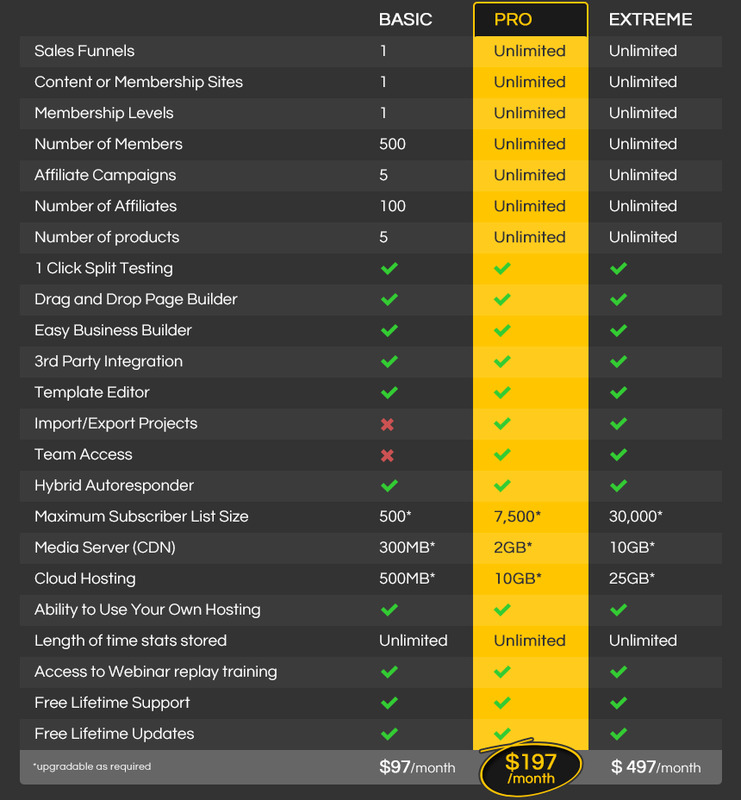 Run your own affiliate program, fully integrated to all your FusionHQ sites and sales processes without doing a thing. Create unqiue affiliate campaigns, affiliate tools and even add your product to the Affiliate Marketplace to get more people promoting for you. Perhaps the easiest way ever to build web pages. 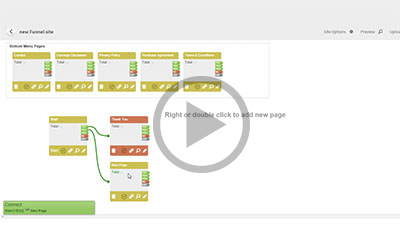 Simply drag and drop page elements, move, re-size and edit them using the intuitive interface. Includes grid system for precise control. Whether it is a sales page or content page you are in the driving seat. Test everything, easily! No scripts or tracking code needed. Just click a button and you have a split test running. You can now test new headlines, video, images, etc... Have new tests up and running in seconds (literally). Easy to see - real time results. 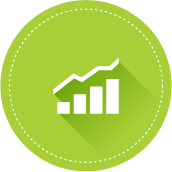 Quick stats show you how well your sales processes and optin forms are converting. Get results from A / B split testing at a glance and see which pages are losing visitors. You can also see which affiliates are performing the best and which products are selling the most. FusionHQ provides you with a range of professionally designed templates free for you to use in any of your FusionHQ sites. You can also easily customize the designs to suit any project. Templates are mobile responsive making them perfect for a range of uses. Everything in FusionHQ is fully integrated. This means there's no need to add code from one script to another, manage multiple 3rd party providers or have the usual headaches of building a functioning system.Other integration advantages include advanced list management. Simply put your sites are built for you(including OTO, exit popup and standard popup code, etc...). All the complicated stuff (the HTML, CSS, Java Script, PHP, files structures, etc...) is taken care of for you.Zero programming skills needed. Or expensive programmers. Building and managing your sites and sales processes in FusionHQ could not be easier, however uploading them to your web host is easier still. 1 Click and it is live on the server in seconds. Upload to our cloud server, or your own server with the click of a button. Easy. Running a good business often requires more than one person. With FusionHQ you can have a whole team. Create restricted user access with custom set permissionsto each member based on their role (eg graphics, support, etc...). Unlimited team members. Drag and drop Facebook comments to your sales pages, content sites or membership sites. Even better you can also publish your content as a Facebook fan page. Great for marketing and advanced SEO. Want to provide a community forum areafor your members? Don't make customers sign up or in twice. Simple PHPBBintegration automatically gives new members an account, and single login. Make images, text, buy now buttons, optin forms or anything else you want appear, or disappear, after a set time period from a visitor arriving on the page. Let your marketing mind wild. Sell software with the confidence that you can disable access should someone cancel or refund. Simple API allows your software to communicate with FusionHQ and auto disable software if needed. Scale your business and never worry about peak loads to your website. Cloud server technology allows you to focus on your business, not on the technical. You can also choose to use you own servers instead/as well as if you prefer. You are in control. 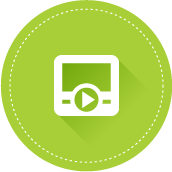 Content Distribution Networks (CDNs) are designed to manage large files such as media files. 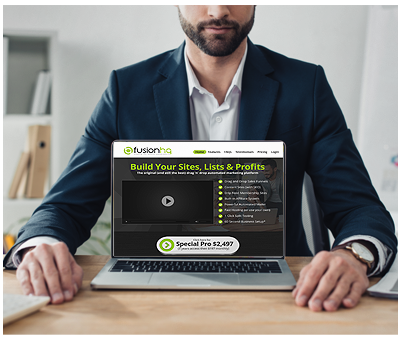 This is great for hosting your downloads, membership site content and sales page videos so they can work fast and not bog down your primary sites. You are free to register your domains anywhere. However for your convenience we offer a domain registration service that automatically sets the DNS to our hosting. 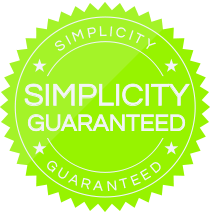 Basically this is an optional service to simplymake life faster and easier. Doing a prelaunch, or a limited time offer? Want one of those nice fancy count down time timers so your customers can see how long the offer has to go? No problem. Just drag and drop, set the time and you're done. Give discounts as a percentage or as a fixed dollar amount. You can also assign affiliates to a coupon code and so track referrals online or offline. Great for promotions and for setting up online/offline integration. Create email marketing campaigns with time scarcity for added effectiveness. 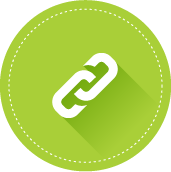 By using 'Magic Link' you can create links inside your emails or autoresponder sequences thatexpire after a set amount of time or on a set date. Love them or hate them, popups have been proven as an effective marketing strategy. Using them has not always be so easy. 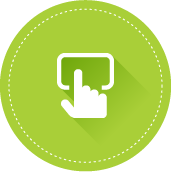 Now you can create optin pages, giveaway offers or entire sales processes as a popup or exit popup. All without adding a single line of code. We have added so much more that it would be impossible to cover everything here. We have a dedicated team working on new ideas all the time (many of which are from people such as yourself). Let us focus on development so you can focus on making money. We know of sites that have been transferred from WordPress to the FusionHQ platform, and continue to rank just as well, sometimes better. We aim to have all questions answered within 1-5 hours, though occasionally technical questions may take a little longer (but not much). We are currently working on a 24 hour hot line to ensure you never have to wait to get your questions answered. FusionHQ was developed for use by Allison Shreeve, Owner & Director. Allison was the keynote speaker at National Achievers Conference with Brian Tracey, in India, Guerilla Businesss School, USA, Harvard University, Parliament House, ICON Summit, National Achievers Congress with Tony Robbins, and Anz stadium, to name a few. Also the Internet Marketing strategist and entrepreneur who went from $37,000 in debt to owning two global companies in less than 2 years and generating millions of dollars online. We also wanted to find out what our users thought about us, so we sent out an anonymous questionnaire to find out. "A wonderful program which has solved many of my information overload problems"
"Love my FusionHQ ... the single best investment I have ever madein the IM sphere!" "So far, FusionHQ seems outstanding. After nine months of abortive slog, I think I might be able to make it with the help of your program"
"Thank you for looking for ways to help your clients overcome their online business challenges"
"I really enjoy FusionHQ. It is very easy to use and I can get a lot accomplished in a short amount of time"
"Seriously Guys... Before I got FusionHQ, I had a full time programmers integrating 5 different systems and they still did not work. This is got to be one of the coolest things I've ever seen since I started marketing online! I can't believe there's something out there that makes building fully managed websites this easy! 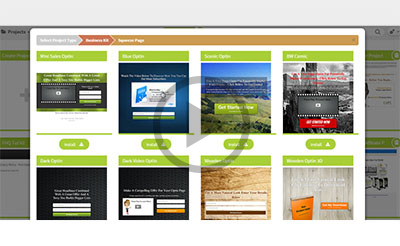 FusionHQ is the best Internet Marketing software you will find on the net. Period! 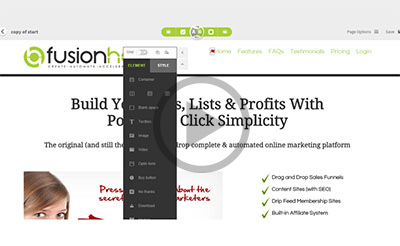 FusionHQ is the ultimate power tool for internet marketers who want to be able to do things the way they want, whether it's sales funnels, websites, or affiliate campaigns. 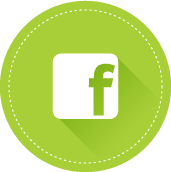 If you're looking to remove the technical side of internet marketing I'd highly recommend using FusionHQ. “We have several successful sites with FusionHQ and I cannot speak highly enough about it.